I had a week of spring-like outfits laid out in all of my optimistic glory and a mid-week blizzard dashed those hopes. I’ll be honest, I was feeling a little blah by mid-week and in an attempt to not wear all neutrals, decided to pop some color in to my otherwise seemingly tame outfits. Here’s a look at a few of my neutral-centric outfits that I took to the next “level” with a pop of color! 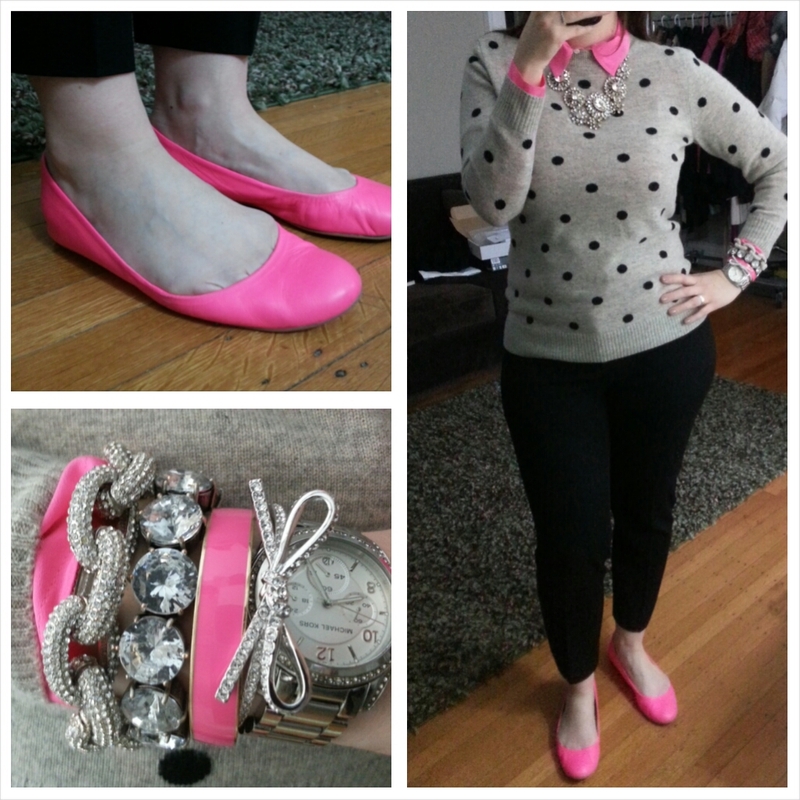 This polka dot cashmere J.Crew sweater is probably one of my favorite items in my closet. The Blythe blouse in shocking pink is a lot on it’s own but paired under the sweater and adding the Cece flats as well as a bright bangle…a few perfectly placed pops of pink and I was ready to brave the snow! (I wear boots to/from work of course! No bare ankles outdoors!) We were sent home from work due to the blizzard so I only got to wear this for a few hours. I’ll definitely be recreating this one again! It was pretty cold that day so I added my J.Crew Wool tipped blazer – here’s a closet up with the necklace. The necklace really tops the whole outfit off! Next up…yellow! On the flip side, I really don’t own or wear a lot of yellow but I do have a few neon pieces from last year and I’m glad to see the trend returning this year for a second season. I recently ordered the Banana Republic Carter Flats in Sunshine Yellow and had them laid out to wear with a more spring-like outfit. Well, I woke up Thursday feeling a bit blah so opted for my cozy but fabulous J.Crew Chandelier Sweatshirt, Banana Republic Sloan pants in navy, J.Crew Keeper Chambray Shirt and the flats. Love! And of course, I added a pendant necklace. So, there you have it. A few outfits transformed with a bit of color. What do you think? Too much? Not enough? Just right? Would love to hear what you think and thanks for visiting! You are SO good at adding contrast! 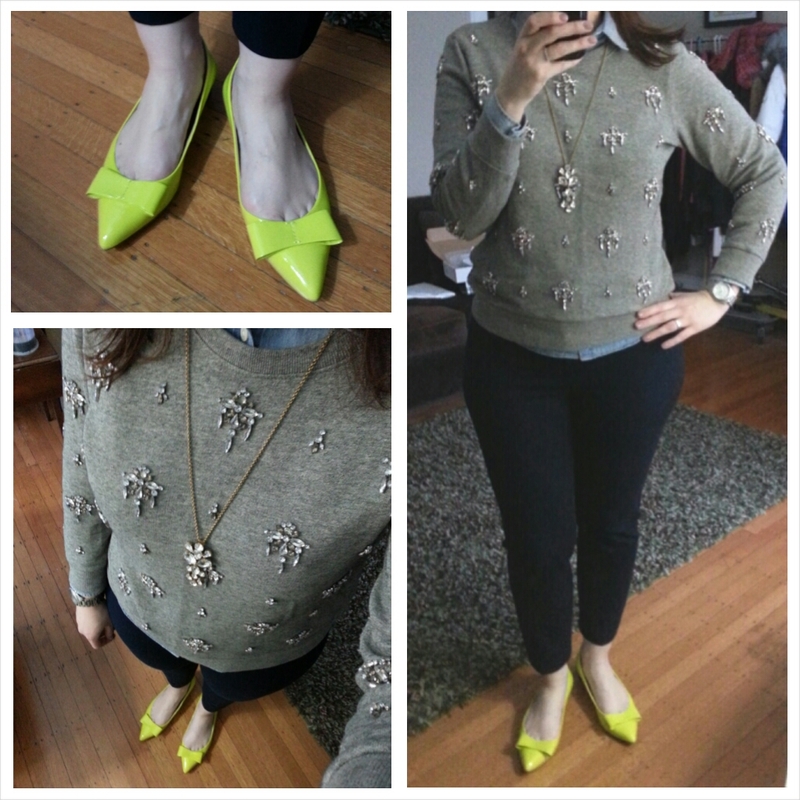 I’m terrible – always matchy matchy and I feel so off kilter if I try to add pops of color. Those Banana shoes are just so..! 80s neon is coming back and is close to my heart. I’m going to master this adding pops of color thing, somehow. You inspire me with ALL of your wonderful looks! The Sloan pants from BR look so good on you! Maybe I should snag a pair and have them hemmed. Also, in the dot sweater you look amazing. 🙂 Both pops of color are inspiring. Thanks for sharing.